The shirt was an item of underwear in the 18th century. It served a hygienic function in an age when daily bathing was not a common practice. Shirts were purchased in the dozens if the owner could afford them, so that a clean one could be worn every day. They were usually made of linen, a washable and durable fabric, in a simple construction. A shirt pattern was a series of squares (for gussets) and rectangles (sleeves, collar, cuffs, etc) which ensured that no scraps were left over after the pieces had been cut from a length of linen. The hand stitching on 18th-century shirts is extremely fine, in order to prevent the seams from fraying during the harsh hand-laundering process. In this example, fine pleats have been ironed into the sleeves, to accommodate the tightly fitting sleeves of the coat worn over the shirt. Man's shirt of fine linen composed of squares and triangles, very finely sewn with a high collar fastened with 3 dorset buttons. Each cuff has eyelet holes for tapes or cufflinks. The sleeve has been pleated during the ironing process. Cross-stitched initials 'H' and 'G'. The front and back are formed from one piece of linen folded in half. The fold becomes the shoulders and a yoke is added to give strength. The neck and front opening are a T-shaped cut made from the fold at the centre front. One side seam has a run and fell seam whilst the other is formed by the edge to edge of the selvedge and is very finely top-stitched. Cross-stitched in blue silk near right side seam. 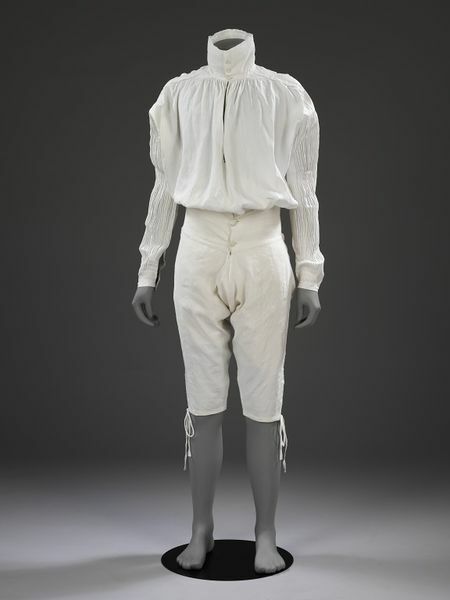 This is the typical underwear of an 18th-century gentleman, made up of breeaches and a shirt. They are designed to be practical and protective, but also fashionable. The stylish 18th-century man made frequent visits to his seamstress to talk about the 'Fashion for Cravats... [and] how Men wear their Ruffles'. of 1710 reported: 'A sincere heart has not made half so many conquests as an open waistcoat'. In the 18th century shirts were classed as underwear because they were worn next to the skin. Although their function was hygienic and their cut, which is based on squares and rectangles, was simple, the best was finely made. The sleeves of this shirt have been pleated to fit inside the narrow coat sleeves fashionable at the time. 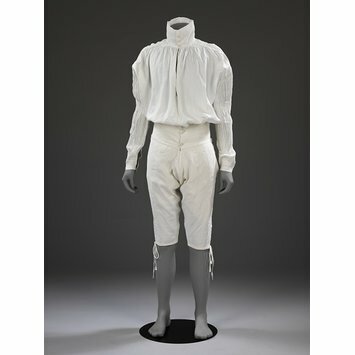 Unlike women, men wore drawers, which were cut like breeches.